With the original lineup together after an eight-year hiatus, and coming off of an incredible performance at Rock On The Range last weekend, Live has been added to the Rocklahoma lineup for Saturday, May 27. Live will be stepping in for Soundgarden, who are unable to perform due to Chris Cornell's untimely passing. Following Live's performance, there will be a brief tribute to Chris Cornell. For the current Rocklahoma band performance times, please visit www.Rocklahoma.com. 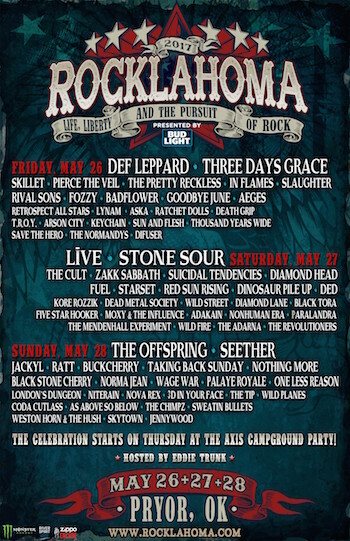 Ed Kowalczyk of Live said, "Although we all wish it were under different circumstances with regard to the passing of the incomparable Chris Cornell, Live is honored and excited to perform at Rocklahoma this weekend. Chris and Soundgarden will forever inspire us and we'll do our best to celebrate and express our sincere gratitude for everything they have given us with our concert. Best wishes to all, and see you Saturday night." "It's been a challenging week for everyone, as Chris Cornell was such a meaningful individual and artist to us. But our belief is he would want us to move forward. We are truly honored to have Live join the Rocklahoma lineup for the very first time, and appreciate the band making themselves available for this unexpected performance," commented Joe Litvag of AEG Presents, executive producer of Rocklahoma. Festival producers also announced that a portion of the proceeds from the festival and live guitar auctions will be donated to the Chris and Vicky Cornell Foundation. 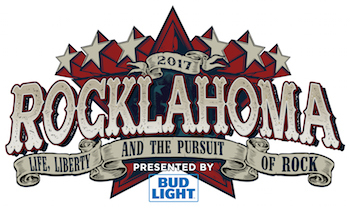 The 11th annual Rocklahoma, presented by Bud Light, takes place May 26, 27 & 28 at "Catch the Fever" Festival Grounds in Pryor, Oklahoma, just outside Tulsa. The festival features the best current rock artists and classic bands, led by Def Leppard, Live, and The Offspring, plus dozens more on three stages, as well as a campground stage with music all night long. The Rocklahoma campgrounds are now open and will remain open until Noon on Tuesday, May 30. Note: Camping is only available with weekend ticket purchases. Rocklahoma is supported by our rockin' sponsors: Bud Light, Monster Energy, Zippo, River Spirit Casino, D&B Processing, PlayStation and more.